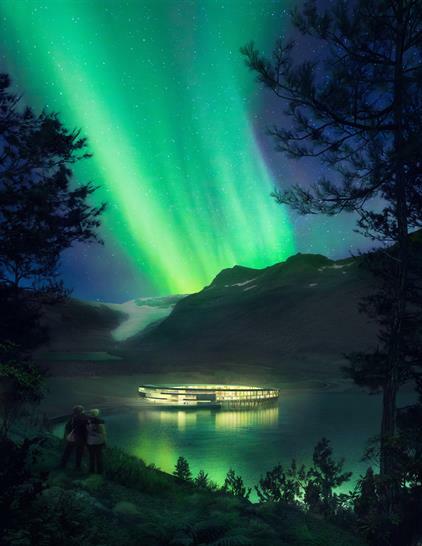 Not only does this new hotel reduce its yearly energy consumption by approximately 85% compared to a modern hotel, but it also produces its own energy - an absolute “must” in this precious arctic environment. 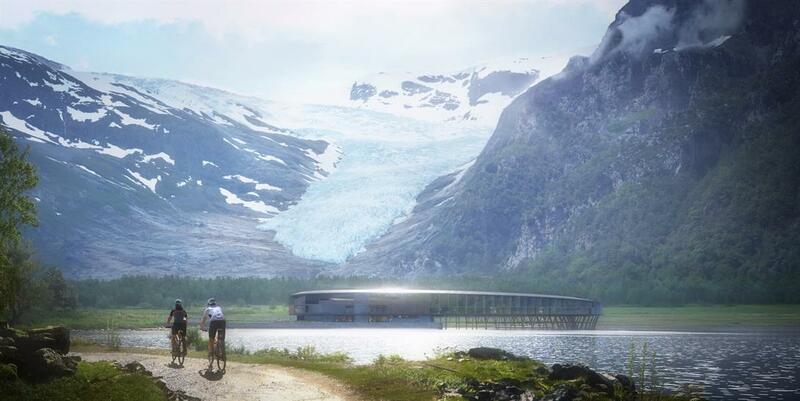 In collaboration with Arctic Adventure of Norway, Asplan Viak and Skanska, Snøhetta has designed the world’s first Powerhouse* hotel, at the foot of the Svartisen glacier that runs through Meløy municipality in northern Norway. The name “Svart”, meaning "black" in Norwegian, is a direct tribute to the deep blue ice of Svartisen and the Svartisen name. As the word for "black" and "blue" are the same in old Norse, the name is a reference to the natural heritage of Svartisen, its precious glacier and its natural surroundings. 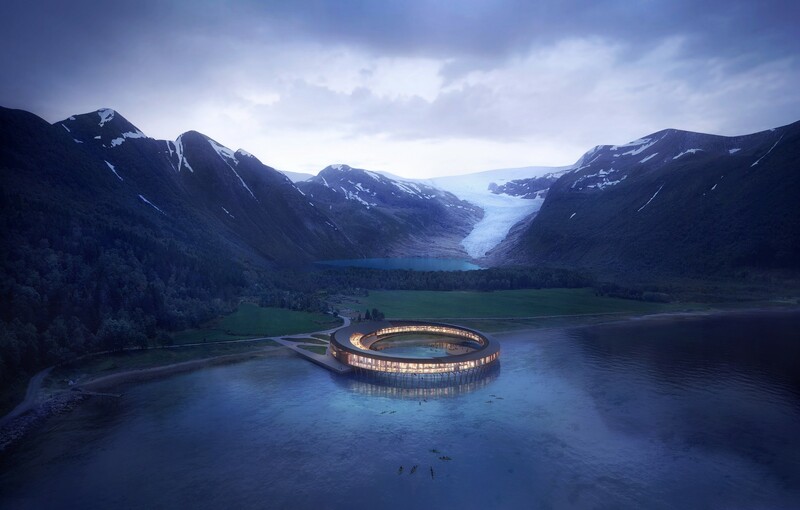 Compared to an equivalent hotel built in accordance with modern building standards in Norway, the new hotel reduces yearly energy consumption by approximately 85%. The hotel is thus the first of its kind to be built in compliance with the Powerhouse standard and will also become the world’s northernmost Powerhouse building. Building in such a precious environment comes with some clear obligations in terms of preserving the natural beauty and the fauna and flora of the site. It was important for us to design a sustainable building that will leave a minimal environmental footprint on this beautiful Northern nature. Building an energy positive and low-impact hotel is an essential factor to create a sustainable tourist destination respecting the unique features of the plot; the rare plant species, the clean waters and the blue ice of the Svartisen glacier, says Founding Partner at Snøhetta, Kjetil Trædal Thorsen. The construction is inspired local vernacular architecture in the form of the “fiskehjell” (A-shaped wooden structure for drying fish) and the “rorbue” (a traditional type of seasonal house used by fishermen). 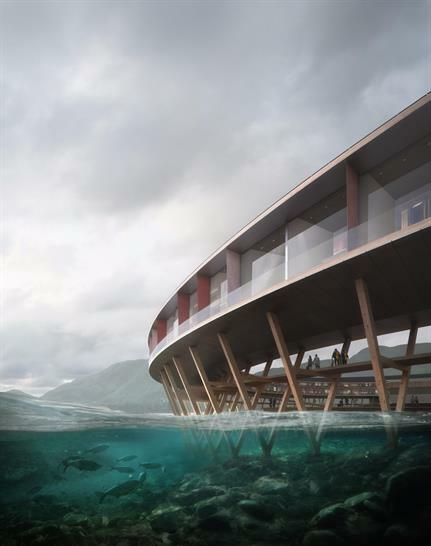 The rorbue reference translates into the hotel’s supporting structure which is built from weather resistant wooden poles stretching several metres below the surface of the fjord. The poles ensure that the building physically places a minimal footprint in the pristine nature and gives the building an almost transparent appearance. 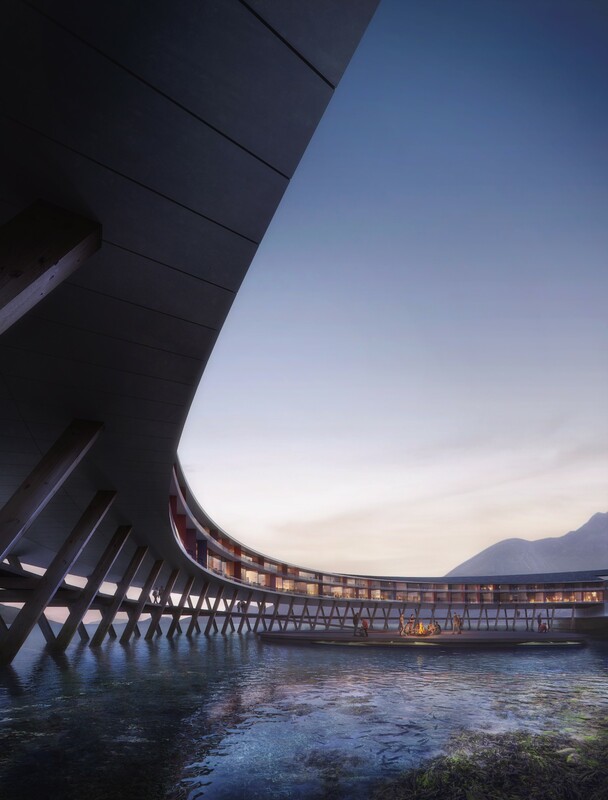 The precious nature surrounding the hotel can only be accessed by boat and there are plans to introduce an energy neutral boat shuttle from the city of Bodø to the hotel. To reach the Powerhouse standard, several cutting-edge design choices have been made. For example, the architects have conducted an extensive mapping of how solar radiation behaves in relation to mountainous context throughout the year to optimize the harvest of energy. The result of the study has been an importance premise for the circular design of the hotel, and both hotel rooms, restaurants and terraces are strategically placed to exploit the Sun’s energy throughout the day and seasons. The hotel’s roof is clad with Norwegian solar panels produced with clean hydro energy reducing the carbon footprint even further. Secluded terraces provide a shadow play in the façade of the hotel while also ensuring privacy. The facades protect against insolation from the sun in the summer when the sun is high in the sky, removing the need for artificial cooling. During the winter months, when the sun is low in the sky, the large windows of the façade allow for a maximum of insolation to exploit the Sun’s natural thermal energy. Materials with low embodied energy have been used to reach the Powerhouse standard. Embodied energy is the amount of energy that is required to produce, transport, build and replace materials and products that go into a building. Embodied energy is highest in materials produced with energy derived from fossil fuels. The use of wood in construction and cladding minimizes the environmental impact of the building, and typically energy-intensive materials such as structural steel and concrete have been avoided as much as possible. Powerhouse is a collaboration between Snøhetta, Entra, Skanska, the ZERO Emission Resource Organization and Asplan Viak. The term “Powerhouse” is used to describe so-called “plus house” buildings that are built by the Powerhouse collaboration. “Plus houses” are energy producing buildings that, in the course of a 60 year period, will generate more renewable energy than the total amount of energy that would be required to sustain daily operations and to build, produce materials and demolish the building. Powerhouse is responsible for several plus house projects, including Norway’s first plus house, the world’s first rehabilitated plus house at Kjørbo in Sandvika, Norway. Today, Powerhouse is building a Montessori school in Drøbak, which opens in February 2018. In Trondheim, Powerhouse partner Entra is building a new Powerhouses at Brattørkaia in Telemark, R8 is building Powerhouse Telemark.